Shooting the breeze with his boys. Tightening his D on the court. Doing a color check — making sure nobody's wearing blue or red, which some Crip or Piru carrying a cut-down golf club would see as disrespect. Then back to Auntie's, hoping she isn't passed out from whiskey at the end of the day. Now that Shawn is headed for high school, he wonders if he'd be better off at the school in Mama's neighborhood, where he'd be free of Compton's hassles. But then he wouldn't be with his fellas — cracking jokes, covering each other's backs — or the fine Marisol, who's been making star appearances in his dreams. Dad says he needs to make his own decision, but what does Shawn want, freedom or friendship? 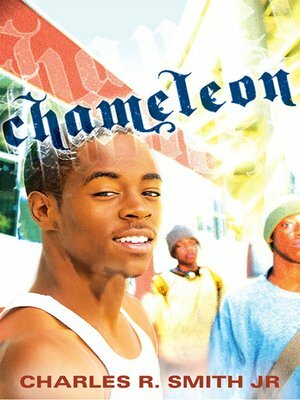 With teasing, spot-on dialogue and an eye to the realities of inner-city life, Chameleon takes on the shifting moods of a teenager coming of age. More about Charles R. Smith Jr.